He usually represents a time of feeling in limbo, being stuck or being prevented from moving forward. He's usually depicted hanging upside down with his hands tied - that's just what it feels like! We need to remain flexible and willing to let go of things, it's probably a time for sacrifice. 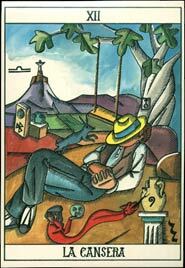 Like the man in this card from the Murciano Tarot, don't sweat it, take some time out and be patient.